I wanted to thank you for your utmost care and attention given to me from the moment I arrived in your office. Your personality and caring manner means so much as did your two assistants Cecilia and Fabiola. Judi was quick to get me in right away so that I could get the care that was needed. You saw the broken tooth and took care of it immediately. This all meant a great deal to me and I just wanted to let you know that I think you and your staff are WONDERFUL ! If I ever need a root canal again I would definitely come back here. Thank you again for your loving care. You are a great dentist and have a great staff. So this was a last minute, emergency appointment for a man with such a phobia of dentists, it took his face swelling up from the pain/inflammation before he would make an appointment to see about a root canal. 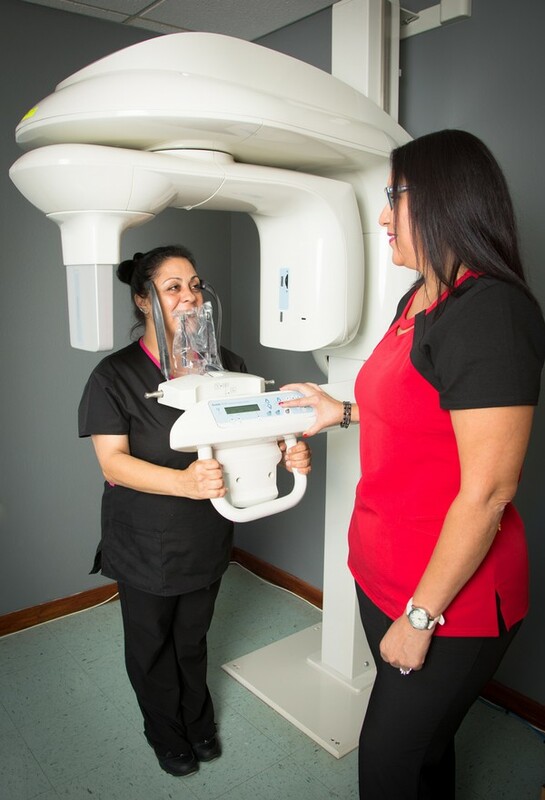 Even then, it was difficult to find a Dentist that specialized in IV sedation in the greater Orlando area, but from the moment we walked in the door of Dr. Dreyer’s office, the staff were warm, welcoming, and quick to act to relieve my boyfriend’s suffering. They worked with us to figure out the insurance paperwork, explained everything they were doing before they operated, and showed such genuine concern that I’m not entirely convinced they aren’t angels in human form. I’m so grateful for this group of people, words cannot accurately express how I feel. We have a follow up in 4 weeks to get the actual root canal done, and I am not actually dreading the experience. Thank you to all the staff and Dr Dreyer himself, you are awesome! I just wanted to say a massive thank you to everybody. As you know, I was terrified when I arrived and both Cecilia and Donna were amazing not to mention Dr Dreyer during my root canal. I was so touched to get a call from you today to ensure I was ok. I would not hesitate to recommend your amazing practice,, thank you again. Thanks for doing such an excellent job on my recent root canal. I had zero discomfort and was actually back to work 1 hour after I walked into your waiting room. You have quite a talent. Thanks again! I just wanted to thank you for all your help and patience with me ! I'm sure it is not too often that you are appreciated for the kindness you share and work you do for patients, so let this note be your reminder today !! I appreciate the friendly service and care you show to me. The phone call I recieved yesterday to see how I was , was so nice. :-) I hope I don't have many more visits- ha ha but may your lives be surrounded by much love, happiness and laughter ! I wish to thank you for your professional services, your generosity and goodwill to have offered root canal treatment gratuitously. There was very little pain thereafter. I appreciated the call from your office to see how I was doing. I will continue to recommend you to anyone in need of endodontic treatment. I would like to take this opportunity to express to you how pleased I am with the endodontic procedure preformed by Dr. Jose Marcos. 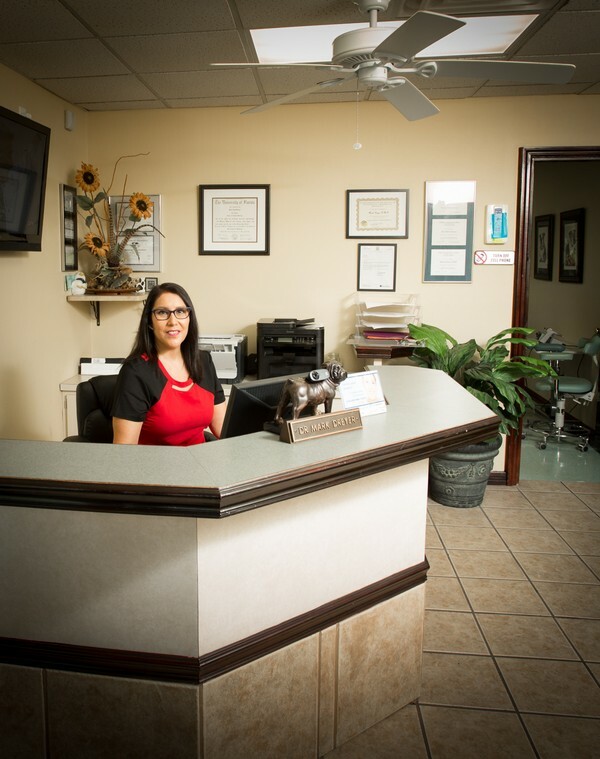 I found Dr. Marcos to be highly professional and took great care in assuring that I was comfortable and at ease throughout the entire process. He was very meticulous ensuring that every step of the procedure was done perfectly and to his satisfaction. I would highly recommend Dr. Marcos and the facilities of Dr. Dreyer to anyone needing endodontic care. You may rest assured that the entire staff is highly skilled professionals and that they take great pride in their work. I just wanted to thank you again for treating my tooth at the last minute. We had a great vacation luckily without much pain. I'm so glad I found you !!!! Painless, wonderful experience. Would definitely come back if I ever need another root canal. He is amazing with that microscope. Thank you for doing my root canal yesterday. It was great to sleep through the night for the first time in three weeks and awake to no pain! You and the staff showed professionalism, compassion, and humor. Though I hope to not need oral surgery for a while, I will look to your office for my future needs. Our Mission is to provide an excellent clinical endodontic service to all our patients in a relaxed, enjoyable atmosphere. 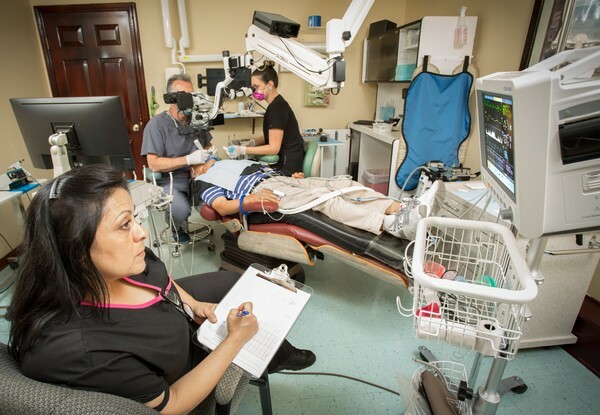 We understand that for many patients, the thought of having a root canal is stressful. We now offer both nitrous oxide (laughing gas), and IV moderate sedation at a minimal additional fee. IV sedation allows us to make you sleepy (we don't put you to sleep). Additionally the sedation results in an anmesia effect so you likely won't even remember the procedure! Many of our patients tell us after the procedure that they can't believe they were nervous about a root canal! 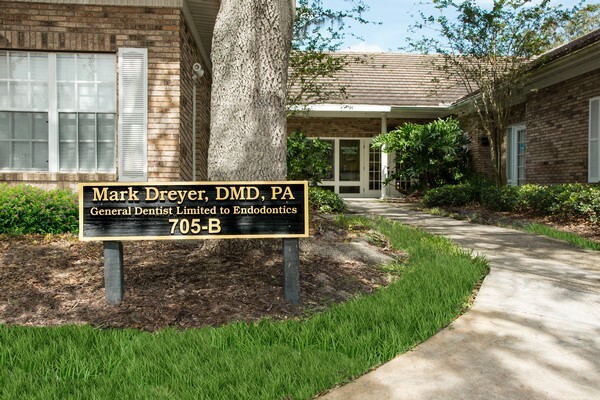 Dr. Dreyer completed his undergraduate and dental school education at the University of Florida in Gainesville, Florida. He received his dental degree in 1986. 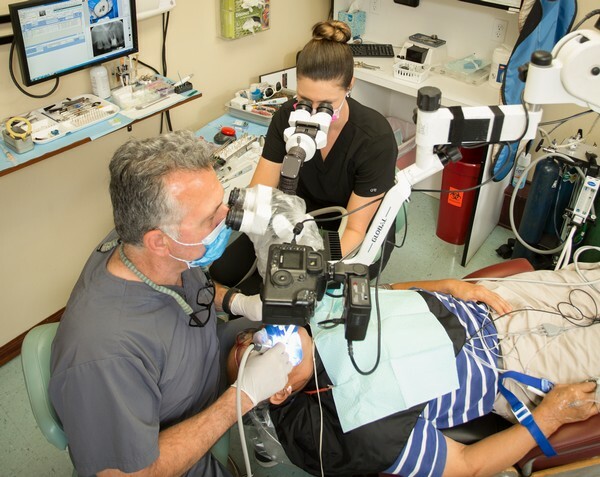 While Dr. Dreyer is not an endodontist, he has spent thousands of hours since the late 90's learning endodontics from interactive forums and hands on courses. On these forums it is possible to read shared literature and to interact by sharing cases. Dr. Dreyer has averaged completion of 800 cases/year since the year 2000. "Dr. Dreyer's pursuit of excellence in endodontics, both biologically and clinically, is extremely impressive. His clinical cases have been consistently top-notch, as are his ethics and patient care"
"As someone who has mentored many clinicians over the years, I have found Dr Dreyer's committment to constant improvement second to none. His disciplined approach to diagnosis and treatment protocols reflects the very highest level of care in our specialty. He has always placed his patient's interests above his own and is always prepared to give his very best to every patient." Dr. Dreyer is the kind of dentist I like to associate with. He takes great pride in his profession and practices at a level that makes endodontists appreciate having him as a colleague. "As a teacher, and having worked with numerous students over the years, I consider Mark Dreyer to be one of the most capable doctors I have met".